It’s no secret that, when taken as a whole, the trends du jour—sneakers, slouchy trousers, oversized sweatshirts, athletic-inspired pieces—go more for an “I’m too cool to care” vibe than “I’m really put-together.” That being said, there is such a thing as taking it too far, and when this happens, you end up with a seriously tragic case of looking like you took no time putting your look together. Why does this happen? We came up with five reasons you end up looking not put-together, as well as tried-and-true tactics for fixing your look. The good news? It’s a relatively easy problem to remedy. Scroll down for five reasons you don’t look put-together, and pieces you can shop now to fix it! While we’ve seen that dudes prefer a messy walk of shame-inspired outfit, there is a right and wrong way to do this. The wrong way: wearing something with too many wrinkles, a piece that’s just too oversized, and tossing together too many hobo-chic pieces in one outfit. 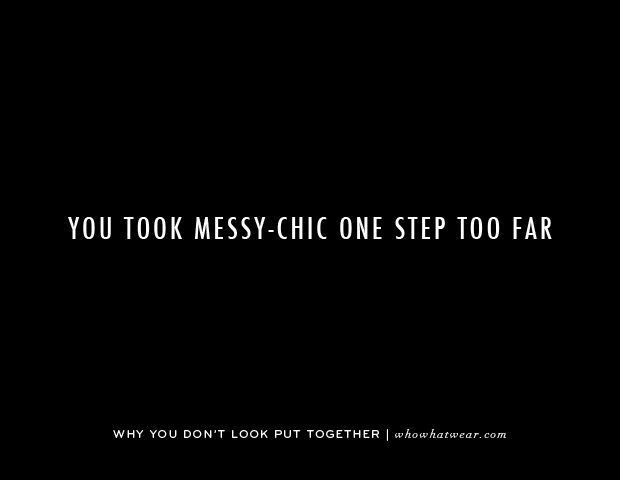 How to fix it: Make sure your messy-inspired outfit still looks crisp by only wearing pieces that look high-quality. And make sure you iron or steam any delicate fabrics before you wear them! Instead, try slouchy basics that look high-quality. It was the legendary Coco Chanel who once said you should always remove one accessory before you leave home—and she had a good reason for saying so. Keep layering on necklaces and slipping your arms into bangles, and you’ll end up looking like you walked out the door through a bedazzler. How to fix it: Stick to minimal, ladylike jewellery. 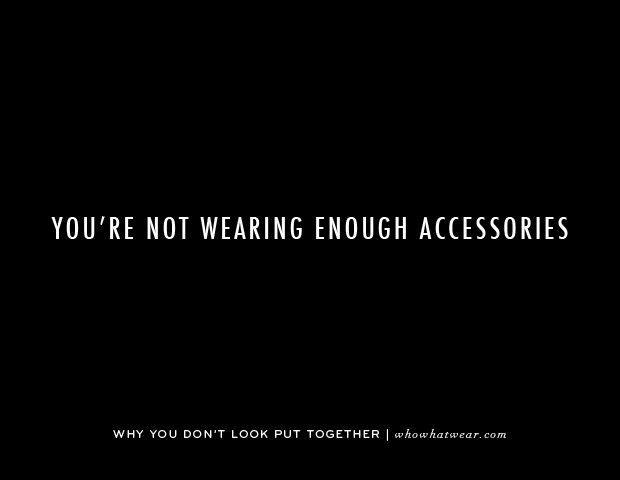 And yes, try removing one accessory before you leave the house. If you can’t bring yourself to do it, you should be all right as long as you steer clear of chunky, heavy jewellery. Instead, try minimalistic jewellery in just the right amounts. 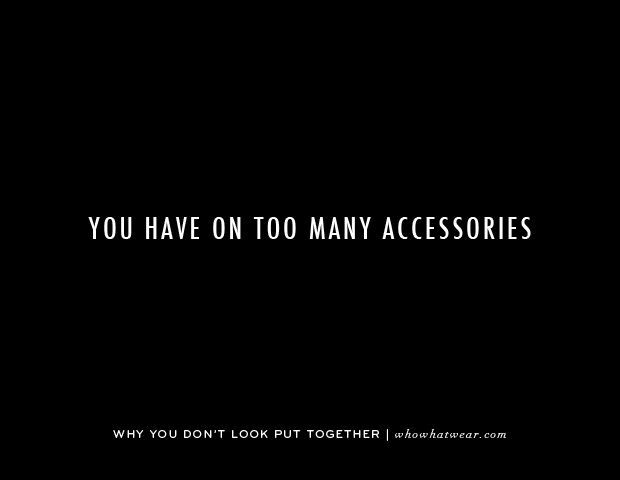 Nothing is worse than a perfect outfit left incomplete due to a lack of accessorizing. You should never leave the house without a proper handbag, your favourite jewellery pieces, and the like. How to fix it: If you find you’re often under-accessorized, try out statement accessories like an on-trend fedora, colourful pumps, or a wide belt. Instead, try punching up your look with statement pieces. A stylish pair of heels is easily ruined by a woman who doesn’t know how to walk in them—and this problem is infinitely compounded when the shoes don’t properly fit your feet. Whether too big or too small, an improper fit makes it really hard for you to walk confidently in whatever shoes you’re wearing. 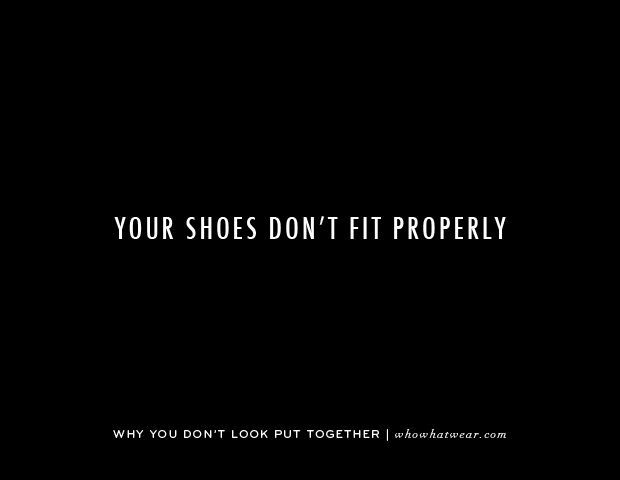 How to fix it: Make sure you’re wearing the right shoe size. If they’re an especially challenging pair of heels, practice walking in them before you leave the house. Instead, try making sure new shoes fit before ever leaving the store. 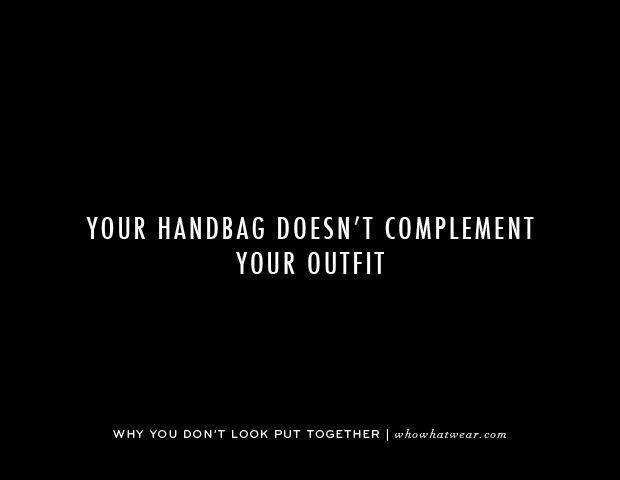 A handbag that doesn’t go with your outfit is another easy-to-make mistake. Sometimes, you just don’t conceptualize your bag as part of your full look, even though it is. While the hobo-esque bucket bag is still current, you should never sacrifice shape for being trendy. How to fix it: Stock your closet with plenty of structured bags. Instead, try a bag in a boxy, structural silhouette.